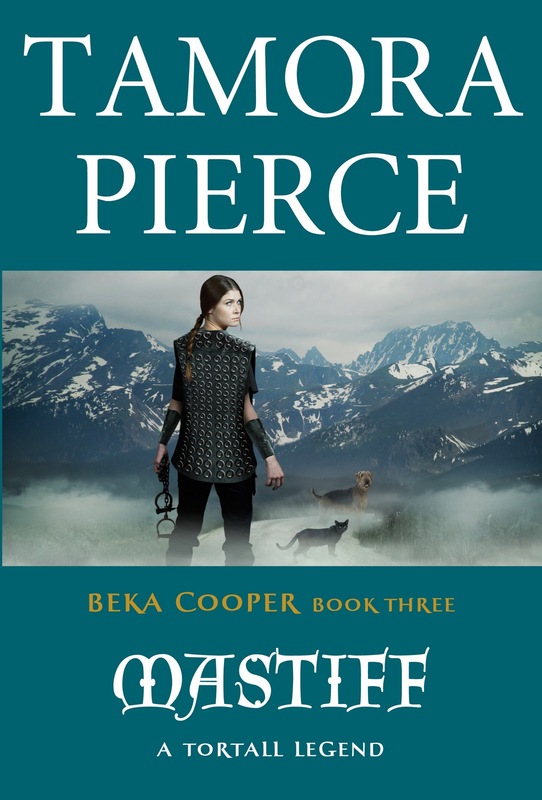 This is the final book in the Legend of Beka Cooper trilogy. Click here to read my review of Terrier, and here to read my review Bloodhound. Beka Cooper has been a Dog for four years now, and partner to Tunstall for nearly three of them. When Mastiff begins, she is burying her betrothed, and wracked with grief and guilt, because no one knows that she was about to break it off with him before he died. She doesn't have much time to think about her tragedy, though, when the Lord Provost calls her out of bed at night and summons her and Tunstall to the Summer Palace, where a terrible crime has been committed. There are traitors living among the royal family that have aided in the kidnapping of the prince, and the Lord Provost trusts Beka, Tunstall, and Lady Sabine to track him. The stakes are higher than ever, and this is the most dangerous trail Beka and Achoo have ever followed. Mastiff is high-speed, complicated finale to this excellent trilogy. Similar to the prequel, Bloodhound, this one unfortunately excludes a lot of favorite characters from the first book, and Goodwin. Thankfully, Tunstall, Sabine, Pounce, Achoo, and new character Farmer keep Mastiff plenty entertaining with their humorous exchanges and quick thinking. Farmer is a character readers probably won't take very seriously at first, but as he and Beka get to know each other better and better, a romance begins to unfold in the midst of attacks, dead-ends, and questions about trust. The hunt for the stolen prince is very long and sometimes quite toiling, but Pierce throws in plenty of action along the way to break it up, and she begins to set the scene for social change that is about to occur in Tortall, taking it from the more liberal world to one where women are stifled by skirts and expectations. She also ties in some history lessons that relate to stories and incidences in later Tortall books that fans will delight in. As the search for the prince winds down and the group gets ever closer to exposing the criminals and traitors, it becomes evident to Beka that something isn't quite right. The shocking ending to Mastiff is heartbreaking and may be hard to swallow for some, but Pierce does leave Beka in a happy place by the end of the story. It's a bittersweet, surprising finale, but a good one nonetheless, and the epilogue, told from Geroge Cooper's point of view, ties everything together nicely and will leave you feeling nostalgic for Pierce's debut book. Mastiff, while unexpected, is the perfect twisty end to this unique and engaging trilogy. Cover Comments: I love the green and the view of the mountains in the distance! I do think that Beka looking behind her is an awkward pose, but it's not too noticeable. What did you think of the ending? It broke my heart! I have been DYING for this book for over a year now! 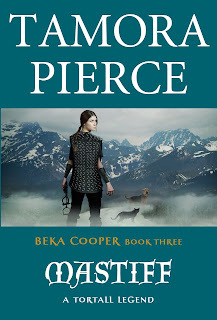 I love Tamora Pierce's Tortall books, and I've really enjoyed the journal style of Beka's books...not to mention the connections to Alanna's time. I've been trying to read this as slowly as possible to savor the last Beka story, but now that you've said the ending is so epic, I want to go pick it up and race through! =) Also, pretty sure once I do finish, I'll just want to re-read Alanna for the millionth time. Hmm... I see what you mean about the cover pose being awkward. The problem is that you can't really tell if you're looking at her chest or back, so if you think it's the front, she looks like her neck is broken. And her arms are too stiff. All this coming from an artist's point of view.